Time Power is a very powerful time management book. When I read the inside cover describing this new book by Brian Tracy, I expected to gain at least 2 hours of extra time per day by following Brian’s strategies. I actually gained more than that. Like most people, I assumed all there was to time management was to get a Daytimer, set up a To Do list etc. No wonder I never got anywhere! Brian has an easy to follow system that is based on over 20 years of research….and his system really works. Why a book just on Time Management? 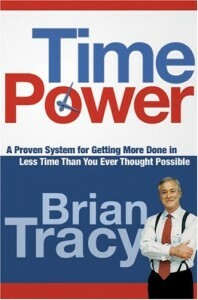 As Brian explains in Time Power, those who get more done in less time get more out of life….more rewards, more success, and more free time to pursue their dreams and enjoy themselves. For many people, getting organized is a real chore. Not if you follow Tracy’s dynamic system. In Time Power, you will find that you don’t have to be cold and calculating to be well organized. Time power does not mean letting the clock rule your life. In fact the opposite is true. : time power gives you absolute freedom to do what you want, when you want to do it, ironically, you even learn to make time for spontaneity. The more time you make for yourself, the more free time you have. Unlike many programs and books on time management, Time Power has no charts, no forms, no dailty schedules. Brian Tracy believes in them but knows that you are quite capable of developing them for yourself. His purpose in this book is to teach you the philosophy of time management, to help you internalize it,a nd to help you develop a belief system that will m ake your every moment very efficient. Time Power is the result of over 20 years of experience—of research and teaching with more than 200 corporations. The program was designed to give you everything you need yo know about mastering your time for your personal life and career. Tracy will show you how to become excellent at time management…to concentrate on the highest payoff tasks. Your life will simply begin to work better. By using the techniques in Time Power, you’ll greatly improve the sense of control you have and in turn improve your well being in every aspect of your life. I know it’s working for me. Time is indeed your most precious and perishable asset. You can begin investing it more wisely by reading Time Power, doing the exercises and putting this time tested wisdom to use. I have read many books, listened to many tape programs and even attended seminars on time management. Time Power is the most results driven program that I have ever used. Use it. It will make a major difference in your personal and professional life.